The early part of the year is the season for taxes, and in the case of many organizations, 1099 forms. Printing labels has long been a strength of FileMaker’s, and printing data out onto an IRS Form 1099 is just another variation on label printing. This is one of those things I seem to revisit every year because the IRS has been changing the format of the 1099 form on a regular basis. There used to be three on a page, and then they made them larger, only allowing for two on a page. They seem to be constantly tweaking the form, and so for clients who need to print 1099s, I am required to tweak the printing process. It should be a simple thing to cook up a layout for printing 1099s, but it can be surprisingly challenging. The problem is that the form is not symmetrical, top to bottom, and so fields that are in perfect alignment with the form on top are too high on the bottom. When you encounter such a problem and need to move subsequent iterations (on the same page) down, the first thing to try is making the body part longer, which makes the subsequent iterations start lower on the page. The problem in this case is that the 1099 already fills half of a page pretty tightly, so as soon as you lengthen the body, the body becomes too tall to fit two records on a page. You can also play with the height of the header and footer, but maximizing those two options just doesn’t move the fields down enough. What to do? FileMaker’s hide object feature can certainly help. You can duplicate your fields and have one set show on the top and have the other set only show on the bottom, and that way you get to have different placement for each set. So what calculations do you use to hide each set? Here we’re using the Mod function to determine if a record is even or odd. In other words, if we’re on record 1, for example, the modulus of 1 ÷ 2 is 1. In that case, we DON’T want the fields to be hidden, and since Mod ( 1 ; 2 ) = 1, they wouldn’t be. A zero value is treated as a Boolean False by FileMaker, and since the result is false, the fields on the bottom of the page would not be hidden. For the first record though, the result would be one, which is a Boolean True, and so the bottom fields would be hidden. I have a client who has different business units, actually separate corporations, each issuing their own 1099s. All of the 1099s are printed together in a single print job. They’re broken into groups by sorting on the corporation ID, and above the body part is a paper-thin subsummary part that’s set to add a page break before each new group. Why is that a problem? If a business unit has an odd number of 1099s, let’s say 5, then the fifth one will fall on the top of the third page. Record 6 begins a new group though, so instead of falling on the bottom of the third page, it lands on the top of the fourth page. Our even-odd logic assumed that odd records would always be at the top, and even records would always be at the bottom, and that’s not the case here. The goal is to have the printed output come out of the printer sorted alphabetically by corporation name, then recipient last name, then first name. Once sorted in this way, we need to identify which records will appear at the top of a page, and which at the bottom. …for records that should appear on the bottom of the page. It’s a little counter-intuitive, but if you think it through, it makes sense. If you’d like to check it out, you can follow these instructions to set up Nagios and configure it to track a FileMaker server. It can also monitor many, many other things, but the focus here will be monitoring FileMaker Servers. Since the instructions are a bit lengthy, this will be broken up into Parts 1 & 2. Part 1, this part, will take you through getting Nagios installed. Part 2 will go through configuring Nagios to monitor your FileMaker server(s). Nagios can be complicated to set up, and since this is just meant to be an introduction rather than a comprehensive overview, we’re going to take the simplest route to getting it installed. We’re going to use something called MacPorts, which is, according to the web site, “an open-source community initiative to design an easy-to-use system for compiling, installing, and upgrading either command-line, X11 or Aqua based open-source software on the OS X operating system.” It kind of does what the App Store does, and it’s been doing it since before the App Store was around. 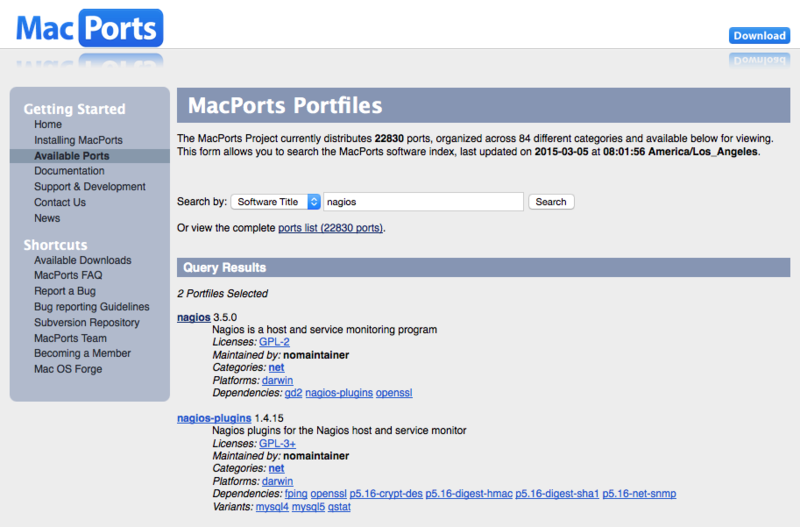 While the App Store is the place to go for OS X applications, MacPorts is the place to go for UNIX software that runs on your Mac, because, hey, it’s UNIX under the hood. Step 1: Go to the App Store and install XCode from Apple. It’s free. It’s also a prerequisite for step 3, so we need to do this first. ..and click on the installer for your version of Mac OS X. This post will assume Yosemite (10.10), but these instructions should work for earlier versions. Once you do that, lots of text will start appearing on your screen as nagios, and whatever dependencies (other applications it needs to work) it has get located, downloaded, and installed. This is WAY easier than installing nagios from source code. It’s also mildly entertaining if you’ve never installed software like this before. When it finishes – assuming it doesn’t run into any errors – it will wrap up with some configuration instructions, which are reproduced at the end of the article, along with some commentary. The web server that comes with Yosemite is Apache. You can verify that it’s running by opening a web browser and putting localhost in for the URL. You should see It works! in the browser. …to get to the etc folder. You can also type in /etc/apache2 to go straight to the apache2 folder. The httpd.conf file can be edited with any text editor. The -p option preserves the ownership settings. Once the file has been backed up, you can open the file (httpd.conf) with the text editor of your choice. As you might guess, these modules enable cgi, allias, and php functionality. You need all three of these modules to be running in order for Nagios to work. The first block creates an alias to the nagios CGIs. These CGIs allow you to monitor various hosts and network services. More about those in a bit. Note the admonition that if you want access to anything, you need to explicitly turn it on yourself. Failure to do so will result in a 403 access denied error in the web browser. Given that initial default setting, access needs to be explicitly turned on for aliases, which is why we added the AllowOverride and Require all directives to the nagios alias. Once you’ve completed the changes in httpd.conf, save the file. Step 7: Set up the configuration files for Nagios. If you have trouble, you can rename them by hand. In that same folder is a folder called objects. Inside you’ll find more configuration files. The first line is a descriptive comment, followed by the command definition. In this example, using the command check-host-alive will cause a ping to be sent to the host being monitored. The host address is passed in as a variable. For now, we’ll leave the commands file alone, so you can close the file. If you get any errors, you can try commenting out the offending line in nagios.cfg and re-attempting the above command until it runs successfully without errors. As the instructions say, you can create other users as desired, omitting ‘-c’ from the command above since it creates the password file. If you click on the Hosts link on the left, you should see your localhost listed, and it should show with a status of Up. That’s it for Part 1. In Part 2, we’ll look at how to configure Nagios to monitor one or more FileMaker Servers. at http://www.nagios.org or locally at /opt/local/share/nagios/docs/index.html to fully understand Nagios. COMMENT: It IS a good idea to read the documentation, but you should be prepared to find that the documentation will assume installation paths that don’t match yours. I’ve included a ‘Rosetta Stone’ at the end of this post that tells you how paths listed in the documentation correspond to paths on your computer. 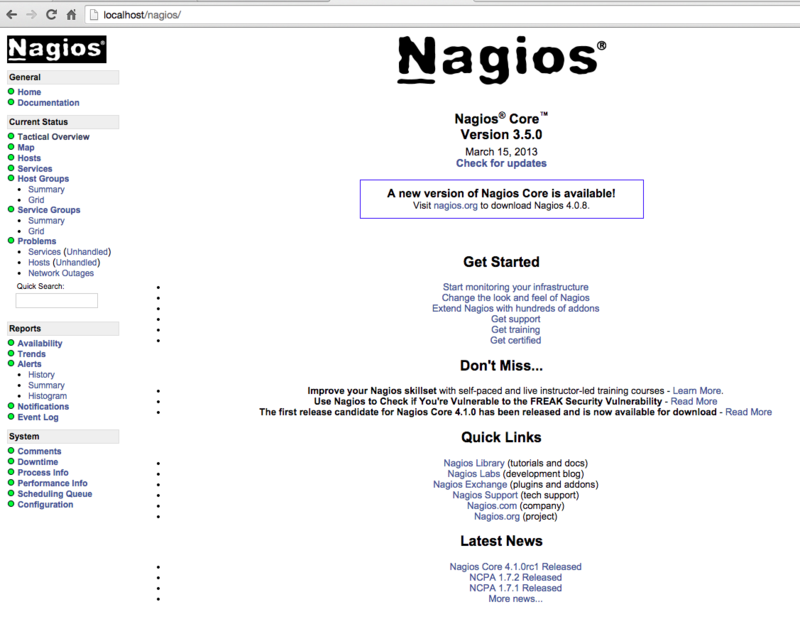 IMPORTANT: A user and group called 'nagios' has been created and you must run nagios as that user. I had trouble with the /nagios alias, and ended up adjusting mine as I’ll show later on. FYI for now. 2) Configure the Nagios sample files in /opt/local/etc/nagios. a) First, backup the Nagios sample files. b) Then rename the sample files for use. contact names to restrict web viewing to your host's by contact.